Me happy at the crag! Now that you have identified what your real fears are, you can now begin to overcome them! It is a long road ahead, so before anything else can be done, it is vital that you WANT this. You can’t just tell other people you want to overcome your fear and it can’t be like the pounds you’ve been “wanting” to lose for 20 years. You have to find the fire within you that genuinely, seriously, intensely WANTS to be without the fears that have held you back your whole life. If you haven’t found this yet, consider what you will be able to accomplish without your fears (climbing that route you’ve been eyeing, for instance, or asking out that person you have a crush on), how your life up until this point would have been different without them, how your body and mind will feel lighter and freer, how you will be able to live in the moment, not regretting the past or dreading the future. At many points along the way, you will be tempted by your fear to give into them and give up on your goal. However, every time you give into your fear, you are continuing to feed its strength and similarly every time you push your fear back, you are bulking up your own mental prowess. Therefore, it is important to keep your goal in mind at all times and though you may take some steps back; remind yourself where your accomplishments will bring you. The below steps to overcoming your fears are a combination of personal experience and advice from two amazing books about overcoming mental limitations written by climbers Eric Horst and Arno Ilgner. I have cited sources when appropriate below. Though many of these tips are climbing-specific, I urge those of you reading who are not climbers to consider how you can apply this to your fears in your daily life as well. Me reaching for the next hold on my favorite route at Crowder’s Mountain. 1) Enjoy and immerse yourself in the experience (1) – Alex Lowe, a famous mountaineer, has been quoted numerous times as saying, “The best climber in the world is the one having the most fun!” Whenever I hear this quote, I think of the people I know who I consider really good climbers. I think of not only their positive attitudes regarding climbing, but also their passion and enthusiasm for the sport. Though I’m sure they have or had fears while climbing, from a third person perspective, it seems like they are having so much fun that they almost forget about them. I know people whose job it is to rock guide; they rock climb all day 5 days a week and the other 2 days they have “off,” you will still find them at the crag. I am guilty of pushing myself towards goals in climbing so much that I see the rock as just another type of “work.” I think there is a time and place for this for sure (because I think “working” on ourselves has so many rewards), but it is also so easy to lose sight of the real “why” when doing this. 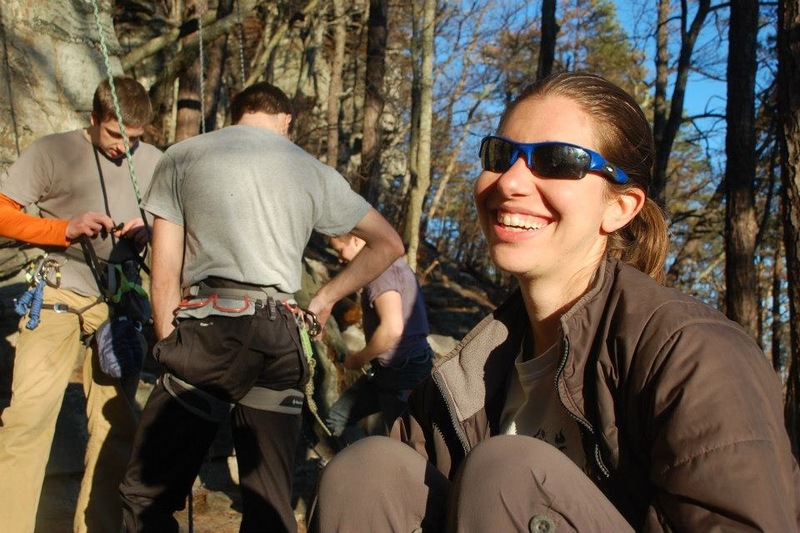 My “why” for climbing started for personal growth and continues to be this in part, but has evolved into a true love of climbing and the climbing community and the experiences along the way. So sometimes when you go to the gym or to the crag, I urge you to throw away all those personal goals and just enjoy yourself! You may find your personal goals become more in focus and also easier to attain when your love is what is guiding you. 2) Remember the journey over the destination and focus on learning (1) – Another trait great climbers (and successful people in general) tend to have is that they believe the learning process is never-ending. 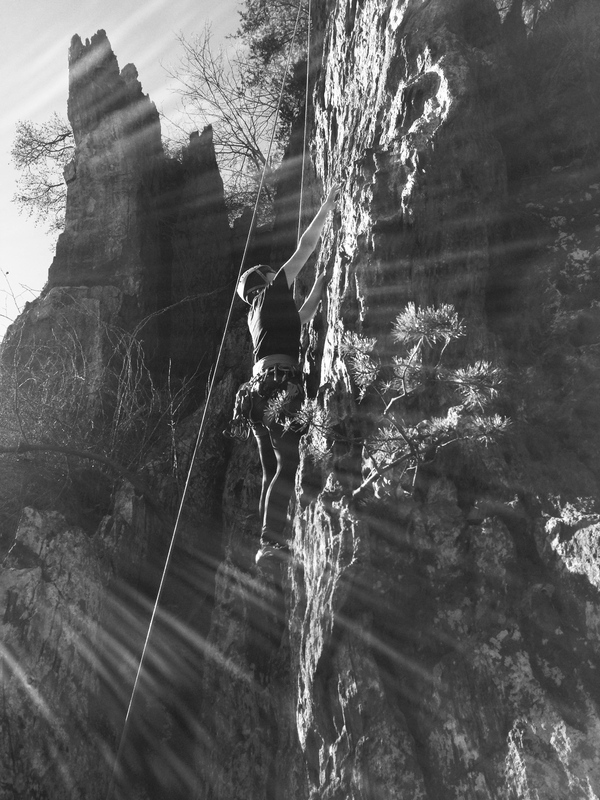 They strive for not just getting to the top of a route, but doing it “clean” (without hanging on the rope). They complete a move, but it didn’t feel graceful, and so they try it again and again and again. They learn through trial and error, through teachers, and through teaching. They are happy to help and happy to be given critique. They enjoy themselves through the learning process and when they “fail,” they understand that as long as they learned something about themselves or a skill, they did not fail at all. Moreover, outside of their sport or their love, they see LIFE as a learning process and see THEMSELVES as an end and also a continuous work in progress. They don’t let others tell them what they should or shouldn’t do or achieve, but instead make goals for themselves (often outside of the box people have labeled them to be within). You can too! 3) See your fears in a kind/amusing way – I realized recently that I view my fears as a solid immovable and serious issue. I view them, ironically, like a boulder- an idea that will not go away without immense physical strength and mental puzzles to “lift” the feelings and weight of my fears. I then thought about what part of me was creating this fear and I discovered it was the part of me that is intent on self-preservation. I softened a little after realizing it is this instinct to survive at all costs that both hindered me and saved me from myself. I labeled this construct “the internal mother.” Just like (most) moms, it has the best intentions in mind (not dying or doing anything to harm me), but is also sometimes too overbearing and too overprotective, so much so that it doesn’t allow me to open my wings at all. Sticking with the mom metaphor, consider now what teenagers’ reactions to moms usually are: roll their eyes and say “Moooooom”. Seriously, I’ll be fine.” Am I right? This is an entirely common reaction as a teen because at that period in our lives, we are striving for freedom, individualism, and control…which is what we’re striving for in this exercise too! Now imagine yourself doing that to your “internal mother.” Every time your fear becomes overwhelming, visualize that fear as a mother and yourself as a teenager rolling your eyes at it and going “Moooom”. Seriously, I’ll be fine.” At the very least, it will cause a chuckle. At best, it will bring you to a realization that what you’re facing right now is not as serious as your fear makes you believe. 4) Be an observer to your thoughts (1) – I wrote before about our thought processes and how they are nearly automatic templates for our reactions to life events. In order to tame them, Arno Ilgner writes that it may help to view our thoughts and our reactions from afar as though we are a third person watching ourselves climb. Often, it is easier to judge whether a reaction is “appropriate” or not if we are not trying to judge ourselves because we do not have our own ego to maintain. In this way, judging our thoughts and actions from a third person perspective is helpful in being able to objectively “see” what may have been unclear within our own minds. For example, even though as a third person, you see that one part of a route is really quite a safe fall and there is no reason not to give 110% to the move, you watch as your body gives in to fear and struggles with committing. 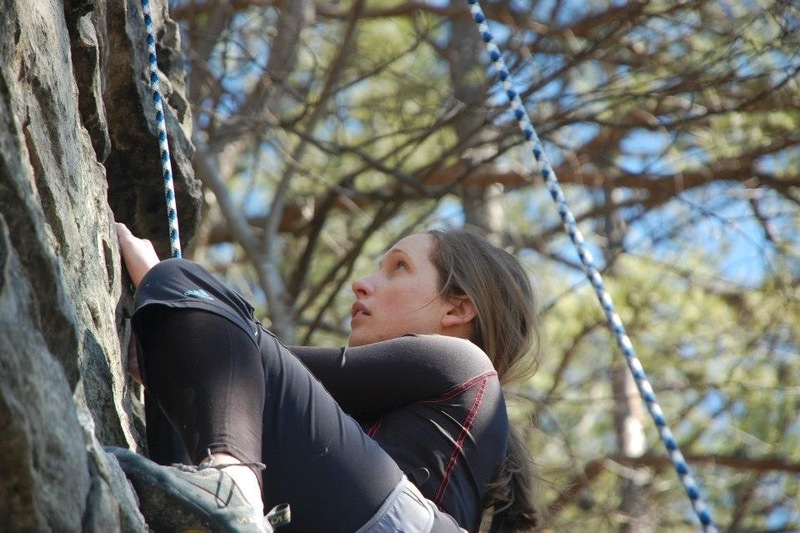 You can then integrate what you “saw” third person into your current climbing mentality in order to react more positively in a tough situation and control your thoughts in a more focused way. 5) Be willful- CHANGE your thoughts and your actions will follow (1, 2) – If you have ever been to a yoga class, you have likely heard the teacher asking you to breathe deeply and focus on setting an intention for the class. Similarly, in climbing (and in almost any aspect of life), setting an intention for a climb will increase one’s chance of success. Oftentimes, we climb or go through life choosing the easiest means of getting to an end or may not even have an end in mind. Instead, choose a path you will take and don’t always be easy on yourself. 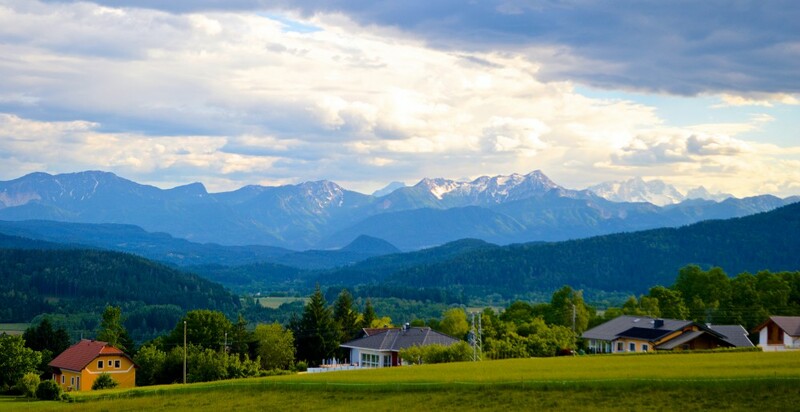 You may have the same intention for an entire climbing session or for many climbing sessions or you may have specific intentions for every climb. Either way, it is important to know your goal. Your goal may even be to just breathe and have fun! It may also be to send a certain number of grade X in one hour. Continue to re-evaluate what your intentions should be in lieu of what your end goal for that day, that session, or that year is. 6) Visualize a positive mindset/outcome (1,2) – Both Arno Ilgner and Eric Horst believe visualization is a powerful mental technique for rock climbers. Whether we actively select images in our mind or not, we have already created images and templates of events in our mind before they happen. 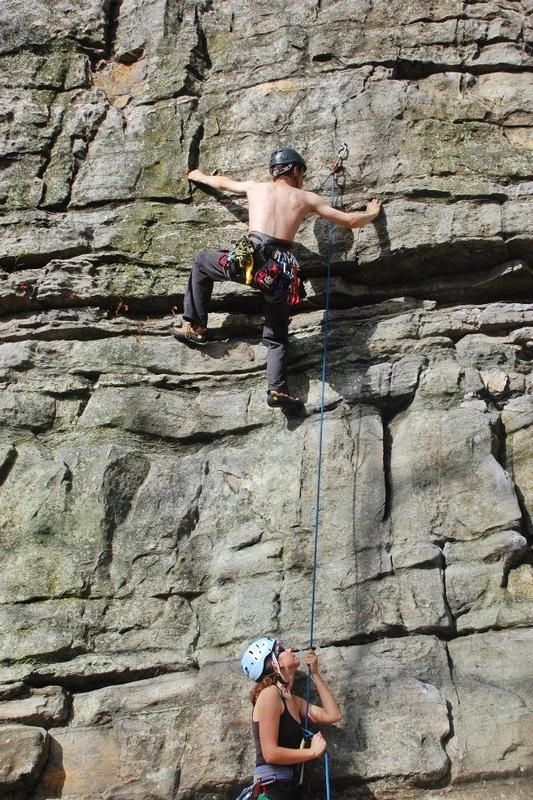 Before going up a route, for instance, we may visualize when we tried that climb previously and flailed on it or injured ourselves or were angry and frustrated. Those images limit us and one of the ways to move past them is to make new images and visualize new outcomes. Instead of thinking about past negative experiences and past results, imagine yourself climbing that route flawlessly. If you know this route has a sketchy part that makes you fearful, visualize a fear-free mind in that section. You may even visualize yourself using these techniques to remind yourself that when things get tough, you have other means of getting past the obstacle besides giving in to your fear. 7) Good posture (1) – I have been told numerous times within my life that my posture needs work, and I know I’m not the only one. My default position in pretty much any picture since middle school has been hunched over with head down, shoulders rounded, and pelvis forward. I knew that my posture was a reflection of my low self-esteem, but what I didn’t realize until recently is that the correlation works the other way as well. Actively fixing my posture with the help of a wonderful physical therapist has also led me to a better self-image and more confidence. Good posture pushes your head up, your eyes forward, your shoulders down and open, and pelvis tucked in directly under your shoulders. Even with feelings of self-doubt, these minor corrections give you something you didn’t have before: the ability to let the world in and be open to whatever happens. To be physically closed is a reflection of living within your head, letting no one and nothing in to help you or give your perspective. When you fear, the tendency is to do just that: close up (physically and mentally). When at least one half of that equation is present (physically with good posture), the mental part comes much easier. Arno Ilgner also associates posture with performing well mentally and physically. 8) Control your breathing and your facial expressions (1,2) – Breathing and facial expressions are some of the few bodily “functions” that are both involuntary and voluntary (conscious and unconscious). Though our breath may hitch or our face may become a grimace instantaneously when something surprises us, we can also control both with enough mental focus. While climbing (and during stressful life events), we often focus so much on our technique, the holds and clipping stances, or our pumped-out arms that we forget about basic functions that we take for granted. Breathing and facial expressions, just like posture, are the foundation of how our mind and body communicate. Believe it or not, if you make your breathing regular and soft and also breathe out while making big moves, your body will be more coordinated and require less effort to move in general. Similarly, if you are making a big move and are grimacing, you are unwittingly telling your breathing to change and your body to tense up and get prepared for additional stressors. In a sense, by controlling these two functions, you can trick your body into working equally effortlessly on a crux as it does on the rest of a route. 9) Know when to listen to a rational fear and when to ignore an irrational one (1,2) – With time and experience comes an understanding of what “feels right” in climbing and what doesn’t as does an understanding of when a situation is truly not safe versus when it is. This concept is called risk assessment. The only way to effectively increase one’s skills in this area is by taking risks in controlled environments such as taking controlled lead falls at the gym. Also, finding a buddy who is far more experienced with climbing and safety and is willing to discuss areas safe to fall and not safe to fall in before going up a climb is helpful too. One can also never underemphasize researching what makes a situation safe or unsafe as well as having a firm knowledge base of how and when to bail a climb based on the circumstances. 10) Don’t make excuses for failure before you’ve begun (1,2) – Though this concept is very similar to the idea of visualizing positive experiences and starting climbs with intention, I have seen too many people do this before a climb (including myself) and wanted to address this directly. After a long day of work followed by some time at the climbing gym, it is easy for me to excuse my poor performance with reasons why I was able to climb X route clean just the other day and now am unable to get past the first move. Sometimes, before I even start climbing, I can just tell I don’t have the energy I usually do or the mental interest in climbing a high grade. At those times, I find myself making comments to my husband like “Oh, I don’t know…Today just doesn’t feel like a high grade day.” or right before getting on a climb say “On any other day I could knock this out of the park, but today I just don’t think I will.” Of course, the vast majority of the time, this is a self-fulfilling prophecy. So beyond being positive, you also must STOP being negative. You may find the latter is even more difficult than the former. 11) Make positive experiences with past negative ones (2) – Has anyone ever told you to “Turn that frown upside down?” I know it is cliché, but the main idea of this saying is what allowed me to come out of a deep depression. I made a goal that with every negative thought that came through my head, I would somehow turn it into a positive one. For instance, if I thought “I really want to go on a walk, but the weather outside is really bad,” I would then follow this up with “It might not be a good day for a walk, but it’s a great day to get some friends together for a game and movie day!” In the beginning, it seemed forced, but over time it became so much easier to be more optimistic and positive. Similarly, a bad experience leading a route (as one example) may make you want to avoid it or think you’re not good at such routes. Instead, turn it into a positive by deciding to top-rope it and get more comfortable with the moves or try it again on lead and think of it as a learning experience and make the intention to learn a better way of making a specific move. That way, the image you have of that route no longer creates a bad feeling. My friend with neutral facial expression, breathing before a big move. 12)Remind yourself of past experiences that were positive (1,2) – It is more difficult to remember traumatic/fearful/emotional events than less salient and more neutral events. In other words, taking a test and failing miserably will stick in your mind more than all the other tests you aced. This is because emotional arousal leads to changes in brain activity and changes in hormone levels (specifically one called cortisol). Cortisol is the primary hormone responsible for a fight or flight response; it is the director of all the bodily functions that need to be modified in order to allow the speediest and most effective response to a threat. With a perceived threat, cortisol tells the gut to stop working on our last meal, increases our use of glucose for the brain, and increases levels of healing chemicals in our bloodstream among other responsibilities. Thus, in times of stress, our brain is working the best, but most other physical functions are severely handicapped. This leads to much greater recall of stressful events (3). Therefore, all those times you successfully solved a problem, passed a test, climbed a difficult route are not going to be at the front of your brain unless you actively bring them to the forefront. Remind yourself about your successes and your abilities with evidence to prove it and get your mind in gear to harness those cortisol levels. 13) Modify your stress response (2) – Above, I explained what cortisol is and what this chemical does to our body. Cortisol is vital to a fight or flight response. It takes a toll on our body, however, when we react with a fight or flight response to daily stressors that are not truly emergencies. Because we no longer have to hunt for food or be in one-on-one battle with large animals or people, our bodies react with cortisol to things like getting into trouble with our boss, having an argument with a friend, being in traffic, etc. Having excessive levels of cortisol in our bodies constantly alters not only our general stress response to true emergencies, but also causes numerous health problems. Fortunately, as climbers, we have a method of modifying these “automatic” responses over time–with climbing! Climbing is in fact sometimes a matter of life and death and we often run into situations that will kick up that cortisol. When we are trying to overcome our fears through climbing, we are also pushing back that threshold when cortisol will rear its ugly head. In the beginning, our body may go into overdrive just climbing to a height of 20 feet. As we continue to climb and push ourselves, however, the height is no longer a consideration in our mind and our brains use our cortisol more effectively for only the cruxes of climbs, etc. You will hopefully also find that as you climb, your daily activities become less and less stress-inducing and you are healthier mentally and physically as a consequence. 14) Practice falling (2) – I discussed my fears in the second article of this series, specifically my fear of failure. I also discussed how the result of fears in climbing is to fall. Therefore, to address both my fear and the result of it, I purposely fell…a lot. The gym I climb at has a “lead cave” where advanced lead climbers can test their abilities on a serious overhang. Since overhanging climbs have never been my forte, I have been gradually testing my abilities in the cave either cleaning a lead route my partner climbed or bouldering. I found, though, that since the first clip was about 14 feet up and I had so little confidence in my abilities in the cave, that I would only boulder 5-8 feet and then would down climb to safety. Eventually, I worked myself up mentally to fall from the height I was so scared of. Once a week for a couple of months now, I have been going to the gym alone and bouldering as far as my mind will allow me and then falling from whatever that height is onto a pad. I keep going up one to two more holds every week. I focus on falling correctly, breathing, and convincing my mind to stop freaking out so much and continuing to remind myself that I have every ability to complete this. A few of weeks ago, I finally reached the first clip without a whisper from my fear. And amazingly, my bouldering has become ten-fold better because my fear no longer prevents me from reaching the top! Practice falls will help you too if you can convince your mind to let you! My pet rat, Monk, who loved jumping off couches. 15) Baby steps (2) – Rome wasn’t built in a night and neither were your fears. You can’t expect yourself to overcome them in one short leap. Therefore, it is necessary to make small goals for yourself in order to get to the larger one. I know many people who are afraid of heights, for example, who have worked their way up to being comfortable with a 30 foot route and higher. 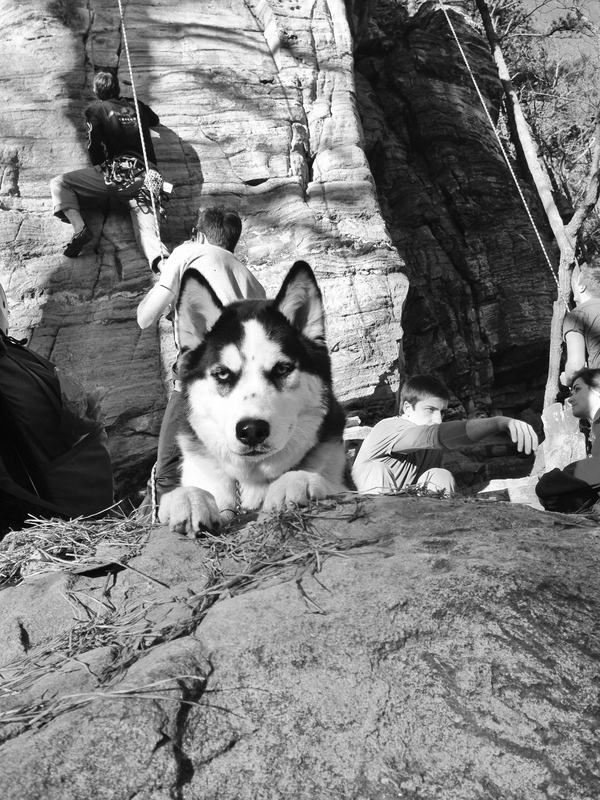 They’ve done this at first not by top-roping, but by bouldering (climbing without a rope). They forced themselves to face their fear head-on. They didn’t allow themselves the safety of the rope and got comfortable with climbing up to 10-15 feet with just a crash pad below them. Once they were comfortable with being without a rope up to that height, they started top-roping to 20 foot, to 30 ft….and then finally outdoors. They continued to inch their way past their comfort zone because climbing to the top of a 30ft wall on day one would have made them so stressed that they would have given into their fear and maybe even given up their goal altogether. Find a way to address your fear in increments and you will find those baby steps add up to a large goal over time! 16) Be around people who encourage you to be a better you. – Until I began climbing, I had never really appreciated how much people give up on their goals and also pull others down with them. This is beyond New Years’ resolutions; I’m talking about daily goals. For instance, at work, you may suggest a change in the current protocol and the only response you get from your coworkers is “Oh, that is never going to change. Don’t even bother.” Similarly, in climbing, it is easier for someone to say “Oh, you’re not a 5.10 climber yet, so don’t bother even trying that route. It’s way too hard.” When you make a goal for yourself like overcoming your fear, people who have these attitudes are people who drain your energy and motivation and will slow you down in your progress of emotional/mental achievements. Find people who will hear your goal and say “Great! What can I do to help you achieve this?” or will encourage you when you want to give up. These people will not only help you meet your goal; they are truly supportive and will end up being great friends. 17) Give yourself a break – Over and over, I have been writing that you need to be fierce with yourself to overcome your fears. But there are days that your mind just won’t be up for pushing your limits. That doesn’t mean you should allow yourself to go backwards, but instead try to maintain your accomplishments thus far. That may mean continuing to get to the same hold on a route that has been making you fearful and you have been working to push yourself on. It could mean taking on routes that you just enjoy doing and try to do them better than you used to and practice using these techniques (ex: breathing regularly, controlling your facial expressions, etc.) on routes you know very well. Mental fatigue is often greater and comes on quicker than physical fatigue, and so allowing yourself to take a break from pushing mental limits but continuing to maintain the neural connections is still steps in the right direction. Dan getting back into the right mindset after an awkward beginning to that first clip. 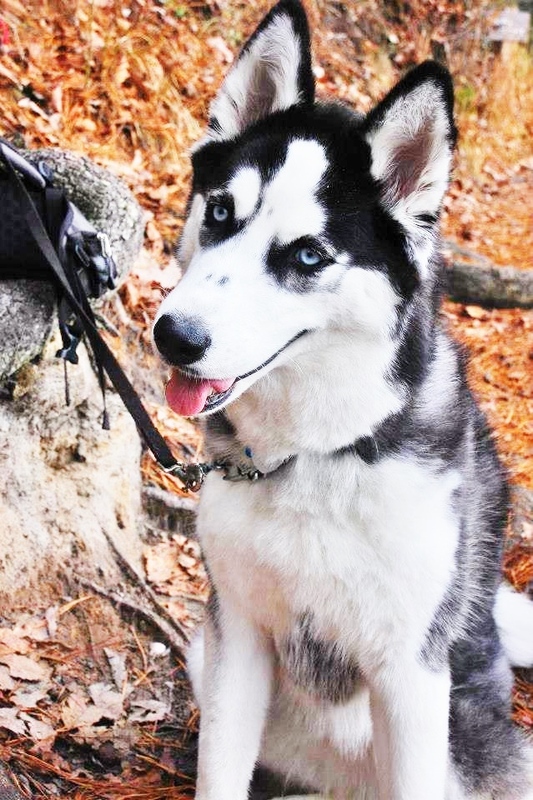 Story 1: I have a Siberian husky named Winter who has become a wonderful crag dog. She prances around on the rocks like she was made for it (oh wait, she kind of was :-)) and has even found more effective and safer ways of scrambling to routes than I have at times. But she is an experienced crag dog now; this was not our experience with her the first many times. For those of you who have been to Pilot Mountain, you likely know of Three Bears Gully. It is a steep trail many take in order to get to the climbing areas. The first time Winter came to the first step, she stopped in her tracks and looked at us with an expression as if to say “You expect to go down there?! No way!” My husband had to carry all 40 lbs. of her (at the time) down the steep gully. Going up was the same problem. Until recently, when she jumped it for the first time herself- no problems, no prompting, no hesitation. I cannot read dog minds, but it sure seemed as though she had been pushing her comfort zone every time we came to the crag and eventually became so accustomed to jumping up rocks that she forgot this area used to scare her. The jury is still out about whether dogs have metacognition (thinking about thinking), but I highly doubt that our dog who will eat just about anything as long as it’s on the ground (including but not limited to cigarettes, napkins, any plant with or without thorns, and even plain dirt) criticizes herself, convinces herself out of something she knows she is truly capable of doing, or allows self-doubt to make a mountain out of a mole hill. Story 2: I used to have two pet rats. 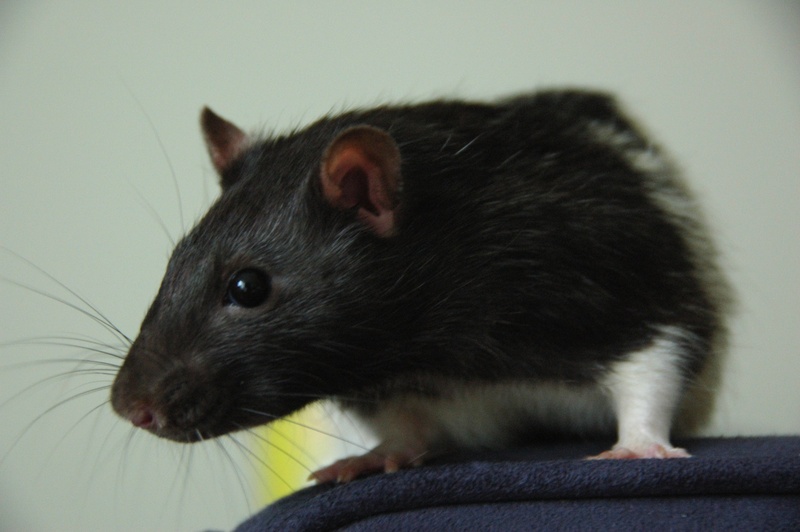 Rats have awful vision (something like 20/200), and thus they use their whiskers and sense of smell primarily to guide them through the world. Because of this, they avoid jumping off of objects unless they can see what they are jumping onto and how far down the ground is. When my rats were playing on my couple foot high couch, they avoided the edge like it was on fire even though they were capable of jumping many vertical feet (especially when being given a bath). One day, my rats got in a tussle and one fell off onto the ground. I put him back onto the couch and not five minutes later, he jumped off again. Needless to say, I could no longer leave them on the couch because this rat decided it was totally fun to jump off the couch after he realized he would be okay. As described above, fear is not unique to people. However, unlike people, both Winter and my rats were able to use one or a few positive experiences and overcome their fear without paranoia or fuss. People as large frontal-lobed homo sapiens, however, generally require more experiences and more will power to let themselves overcome instilled fears. Our brains allow us to think at extremely high levels (otherwise known as executive processes) and understand ideas and networks easily and that is great- but it also provides us with more than enough reason to make limits on ourselves and create fears. But if a husky and a rodent can overcome their fears, so can you! Climb on! This is such a great series of posts. Very human in the way you shared the not-so-good times as well as the successes in taking on the fears that made it challenging at first. Inspirational. Thanks for sharing! Daniel, thank you so much, we hope to inspire others! We have another piece to the series coming soon!